FOR PRICE AND TO ORDER, PLEASE CALL. 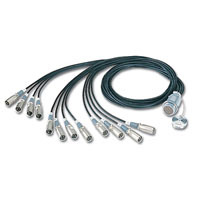 CAN12S1F2 - Canare Fantail, 12-channel, 37-pin male to XLR Female connectors. All versions are pre-assembled using Canare Star Quad L-4E microphone cable wired to JAE Cannon XLR-3 and multipin bayonet lock connectors. The overall fantail length is 5 feet and each channel is fitted with a large, sliding number collar ring for quick identification. Dust cap with chain included on multipin connector.